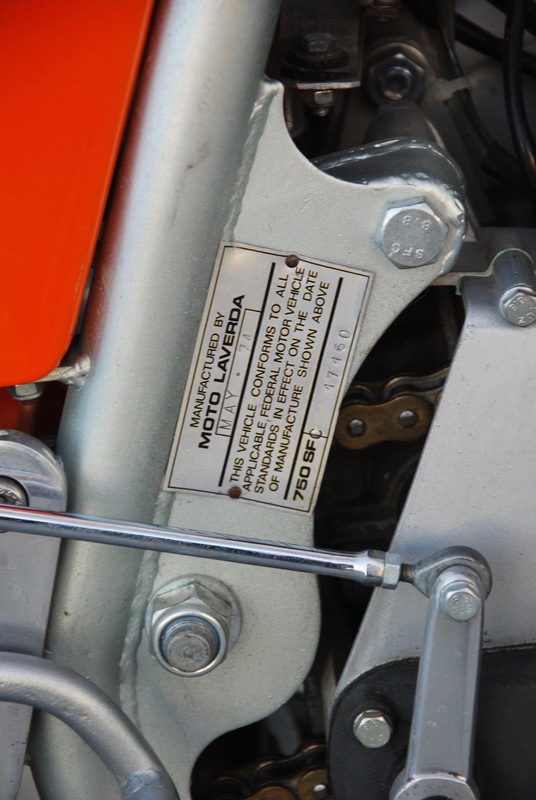 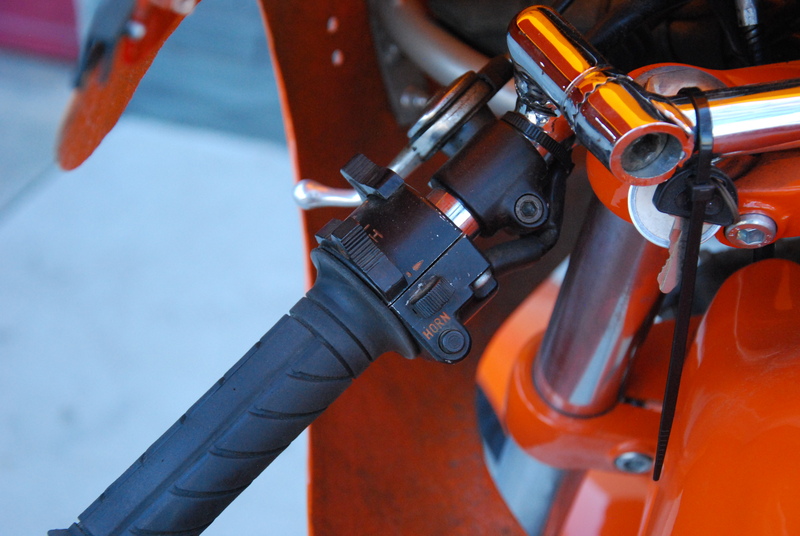 Laverda began with the manufacture of farm machinery, diversifying into production of small capacity motorcycles in 1949. 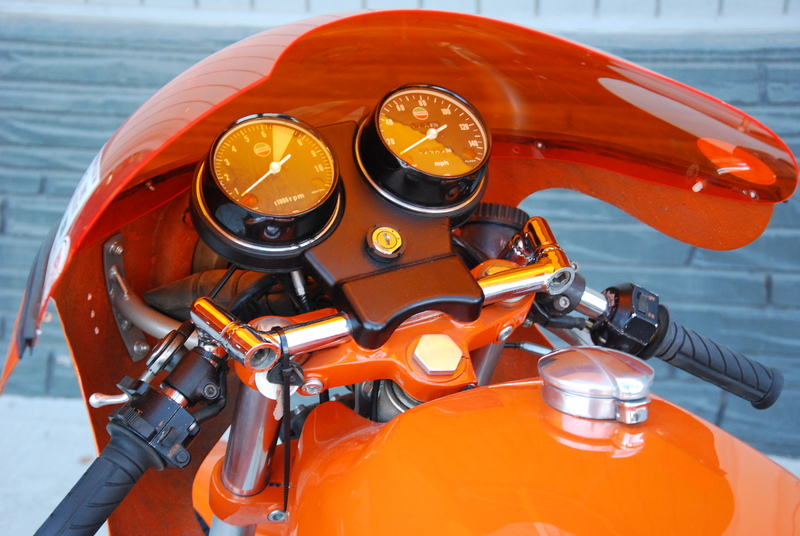 Increases in capacity and variations of design (including a scooter) followed over the years. 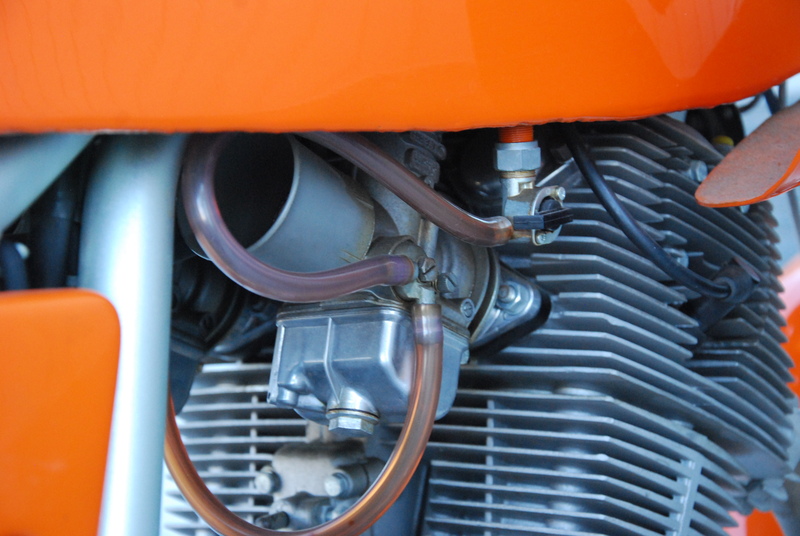 In 1966 they eventually offered a large-capacity 650cc twin. 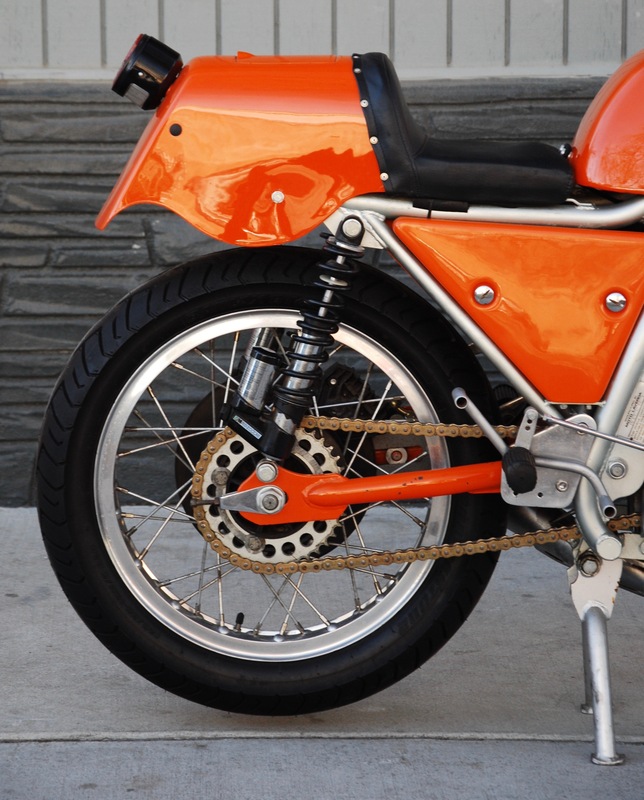 Equipped with chain driven overhead camshaft, the 650 bore a striking visual similarity to the Honda CB77 with its sloping cylinders, and pressed tubular silencers. 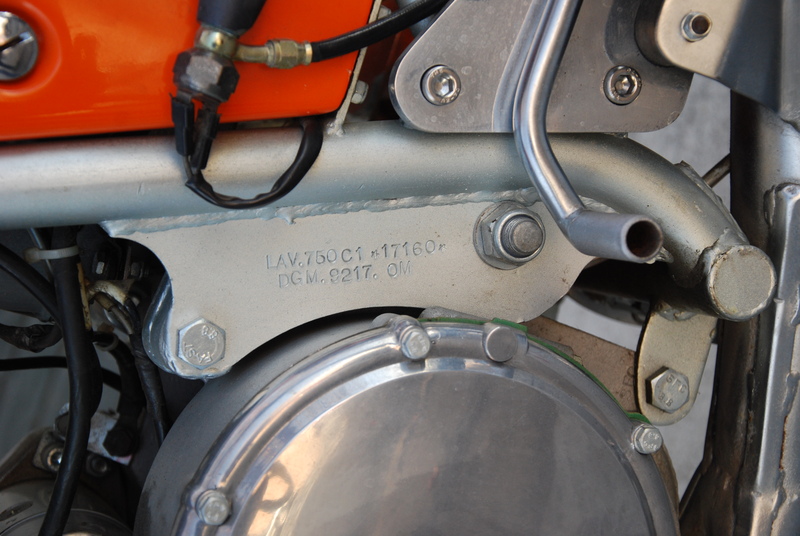 The capacity was enlarged to 750 in 1969, and it was available in GT, S, and SF derivatives. 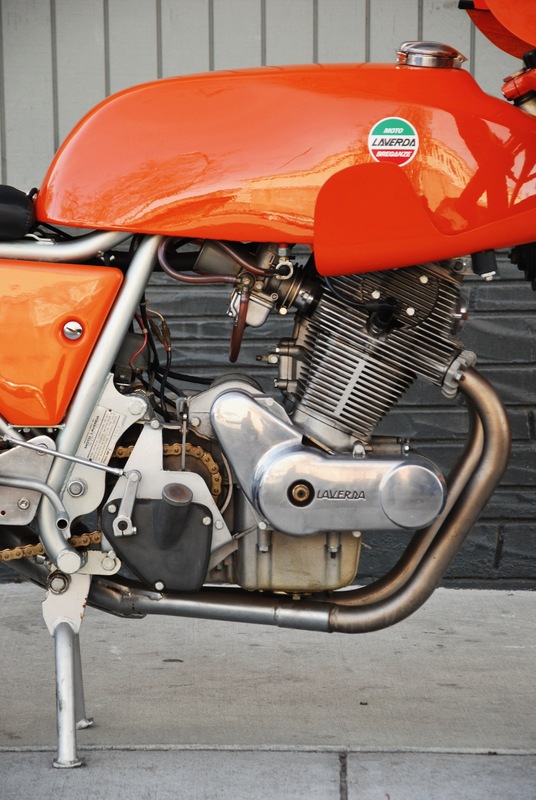 Following some success in production races with a 750S, the factory set about producing a thoroughbred production racing machine to use in production and endurance racing. 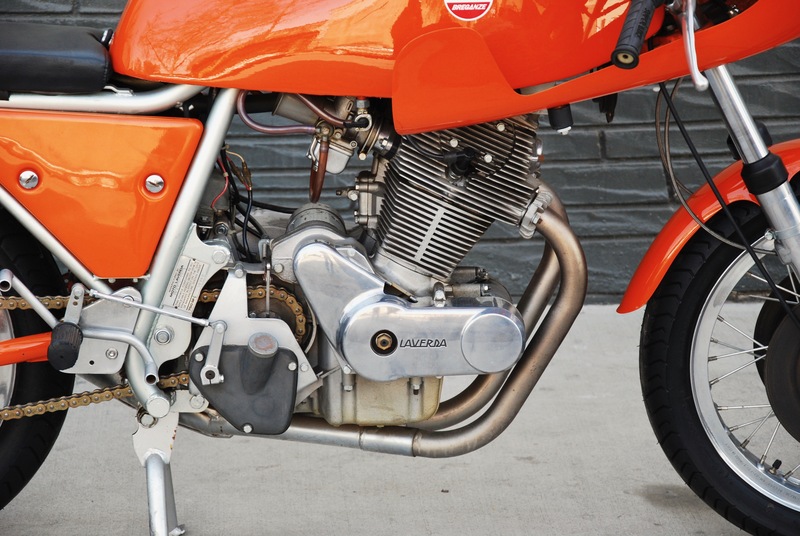 Thus was born the SFC, a full-on production racer that can be ridden to the track. 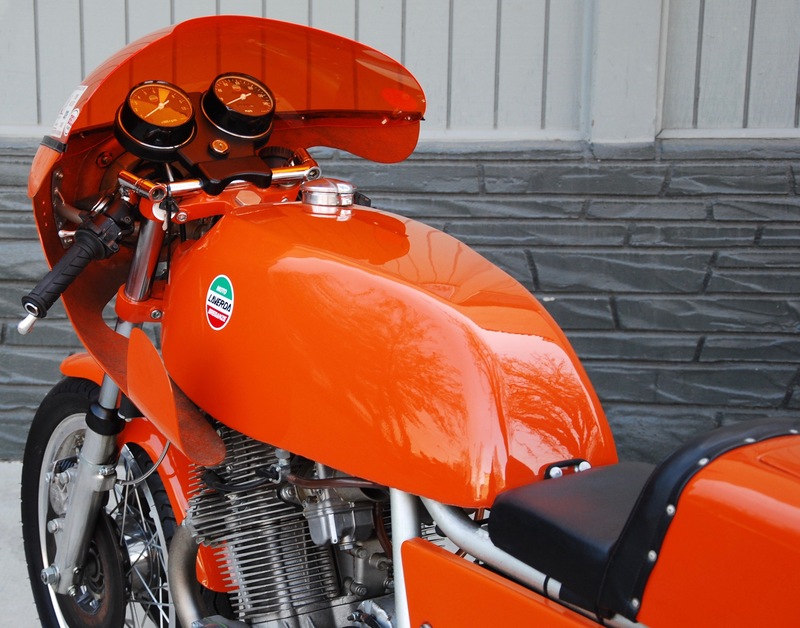 This matching numbers SFC is a North American specification bike; meaning Nippon Denso gauges, Jota bars, real switches, indicators and a Sebring mirror. 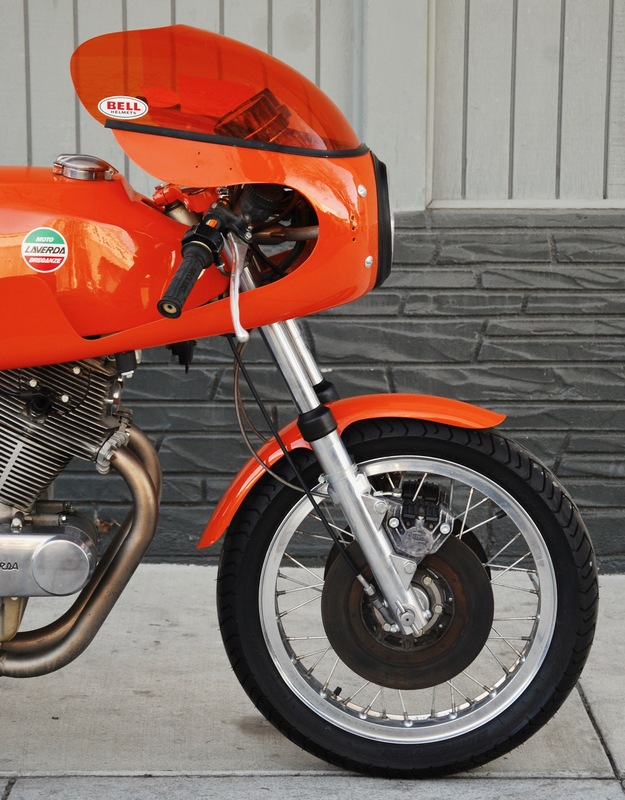 It was formerly on display at the Petersen Museum, Los Angeles and featured on one of their promotional posters. 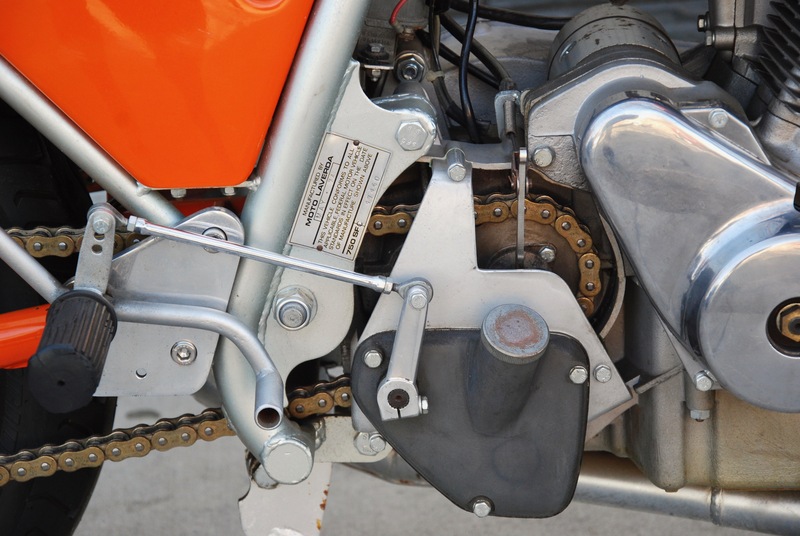 The vendor bought the bike in pieces in a box from the brother of the just-deceased original owner in Reno, Nevada in 2009. 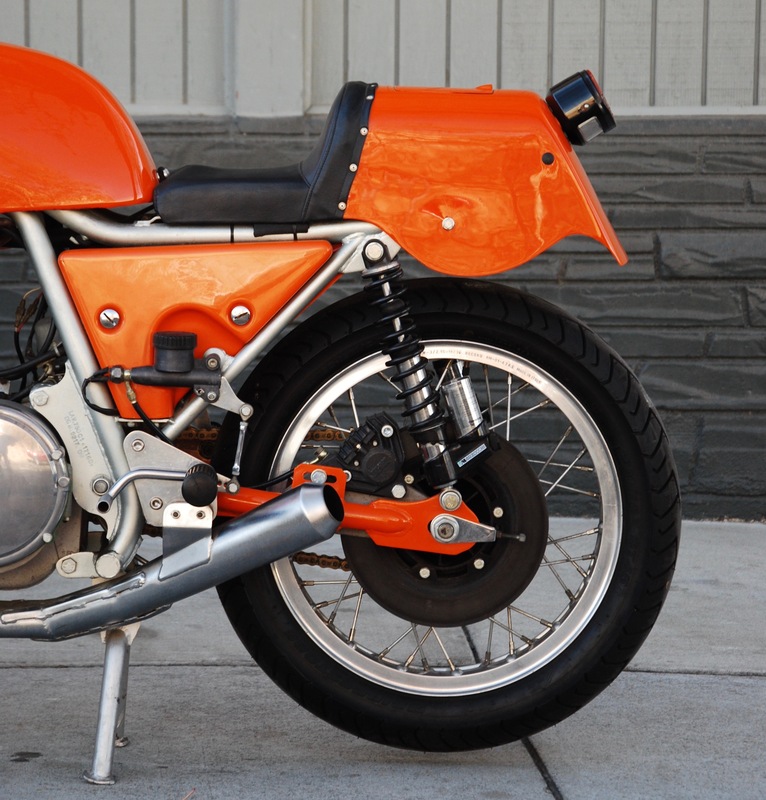 It was first sold in San Francisco, the original owner installed an aluminum tank, currently fitted (the original comes with the bike) and aftermarket rear shocks (the original Cerianis also come with the bike)) and an orange windscreen which was installed in the late 1970s for a regular street commute; there’s a college parking permit still affixed to it. 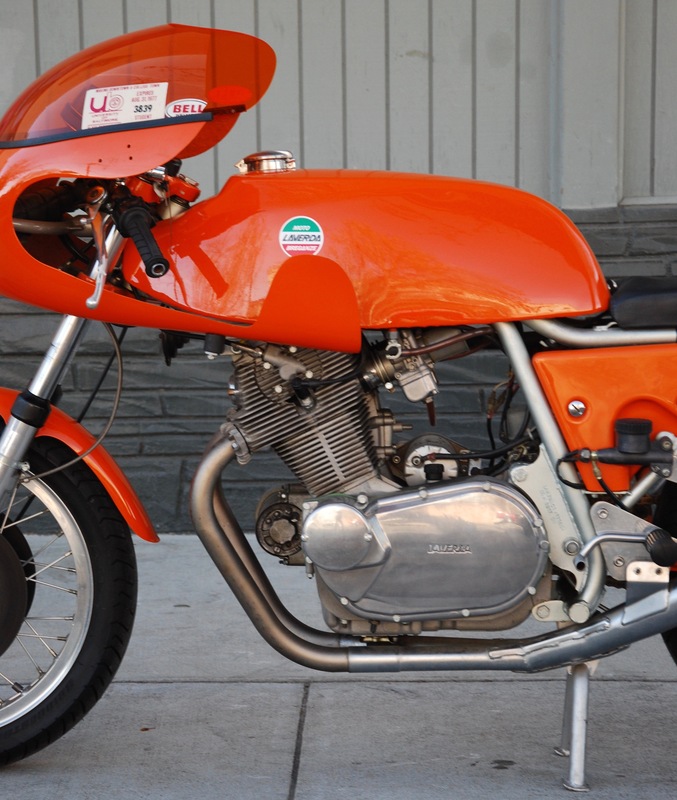 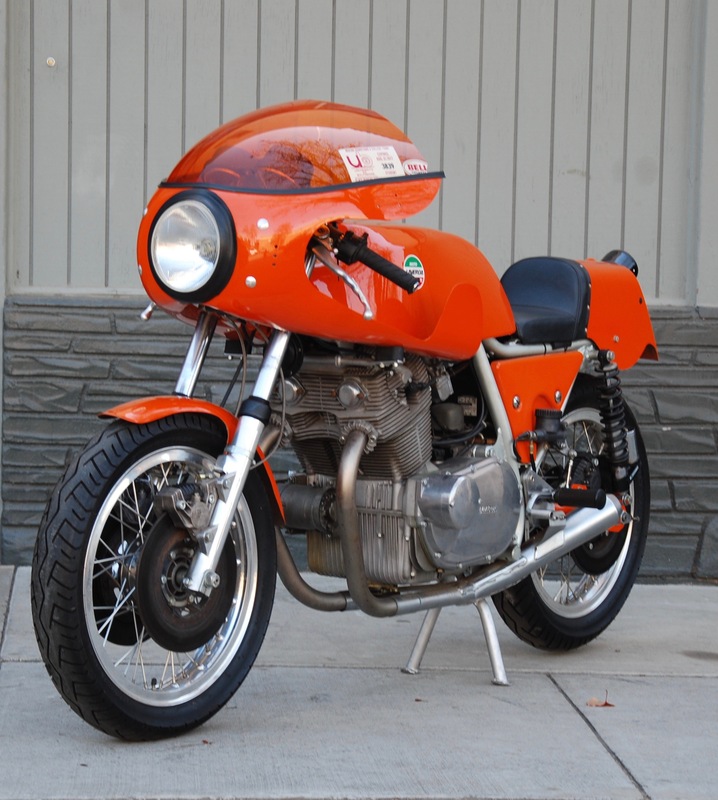 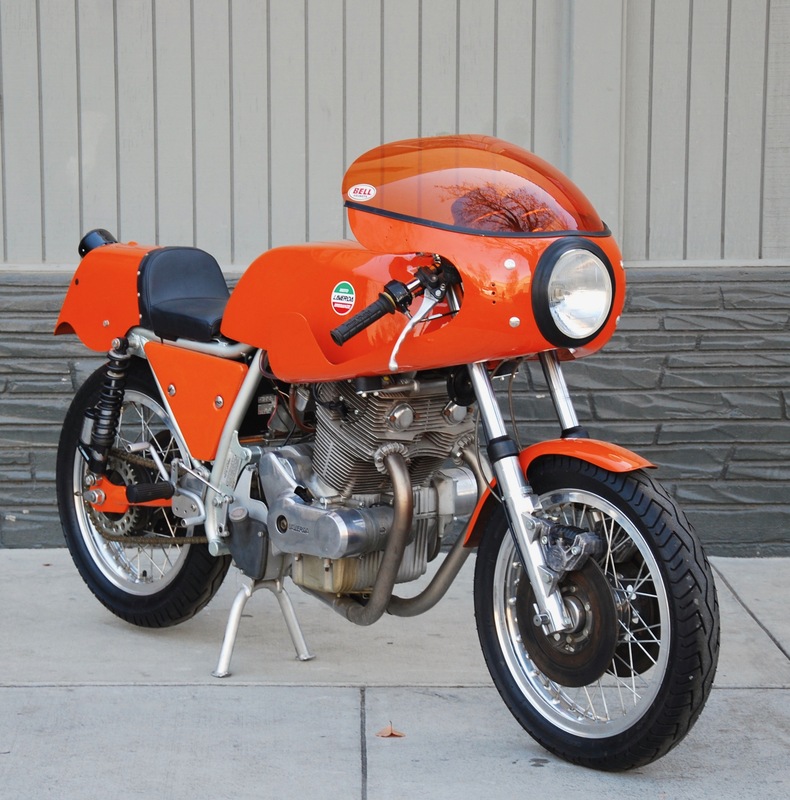 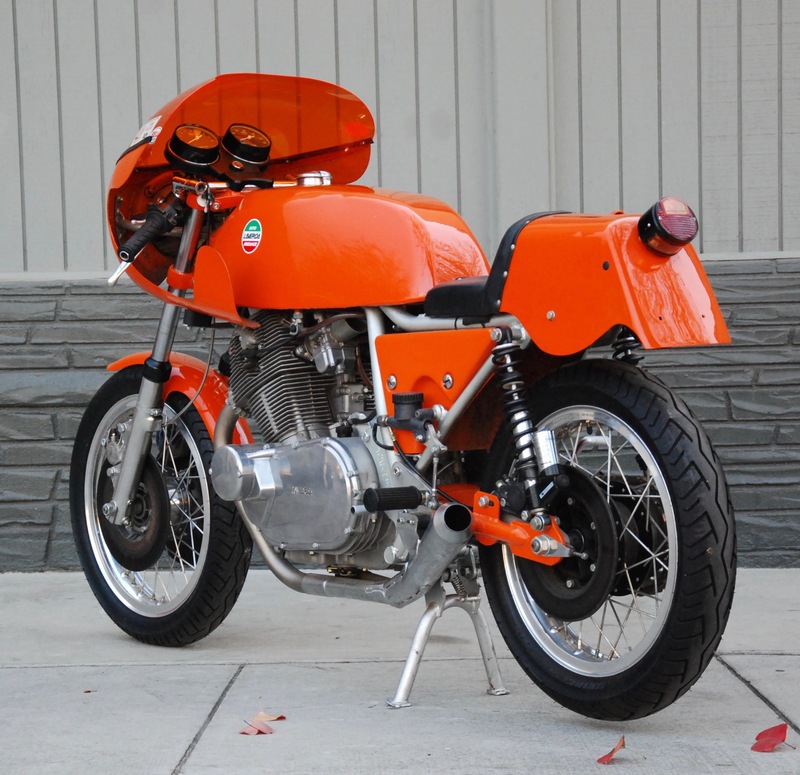 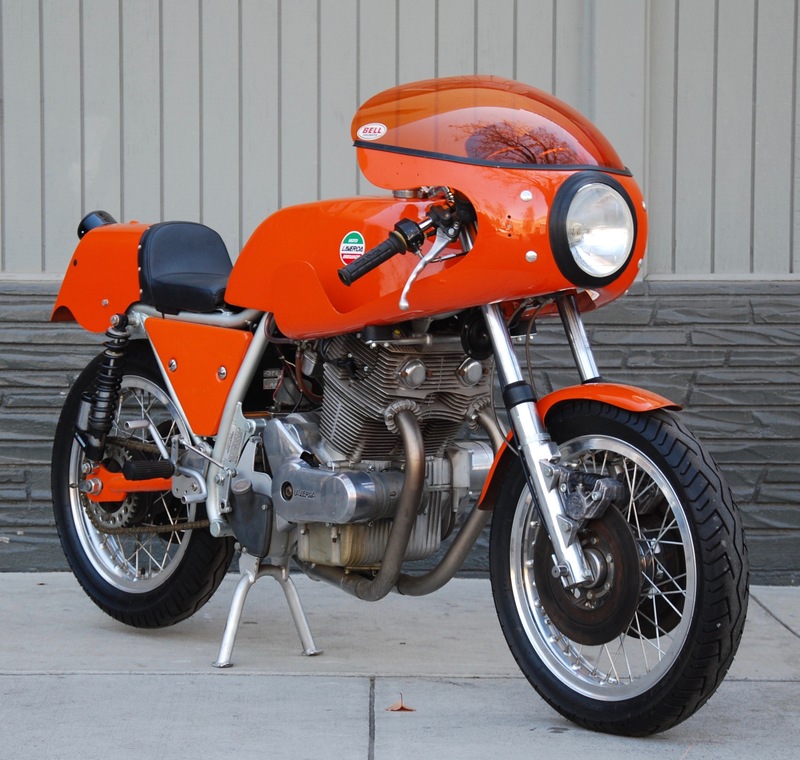 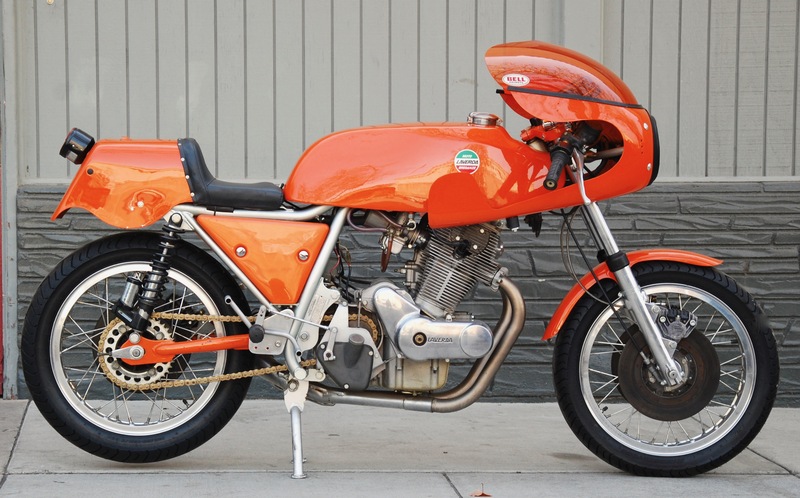 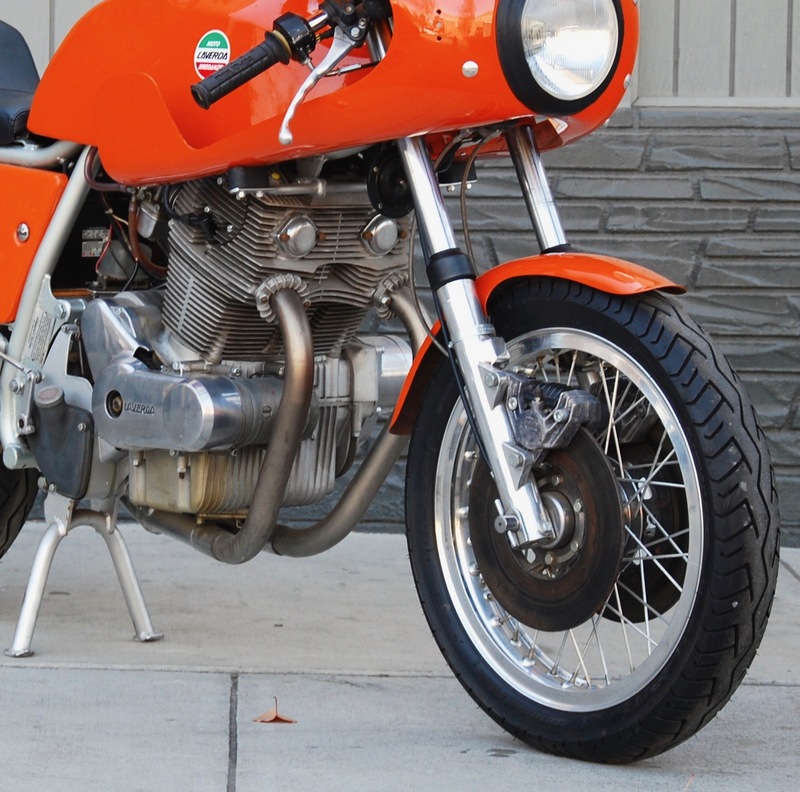 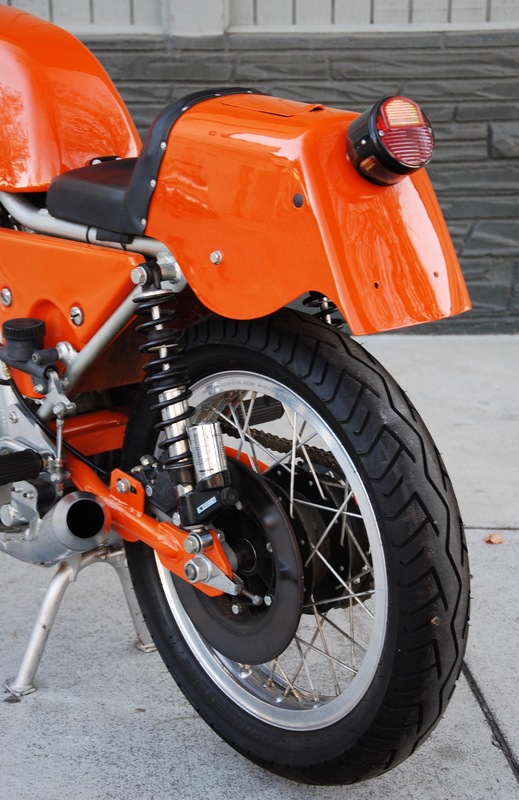 The vendor had a complete build-up and restoration undertaken in 2009/2010 by Scott Potter, the sole proprietor of North America’s only exclusive Laverda specialist, formerly in Texas but now located in Arizona. 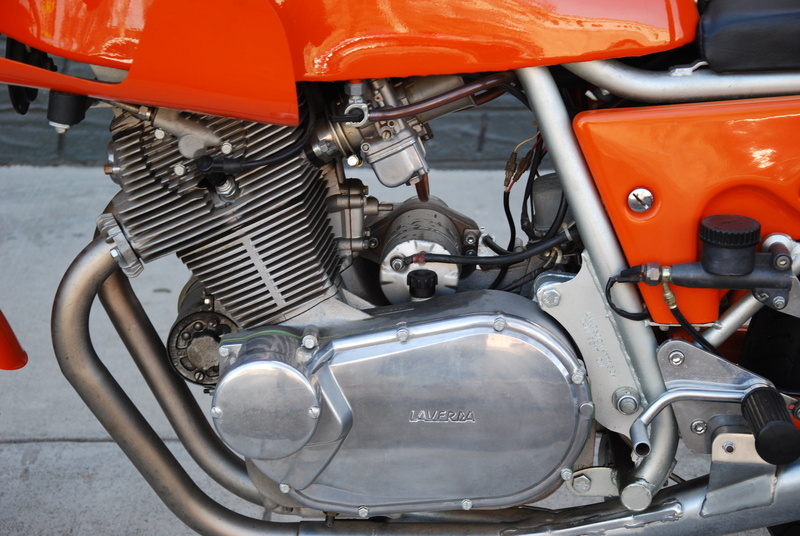 The bike, with very mild re-commissioning, should start and run well. 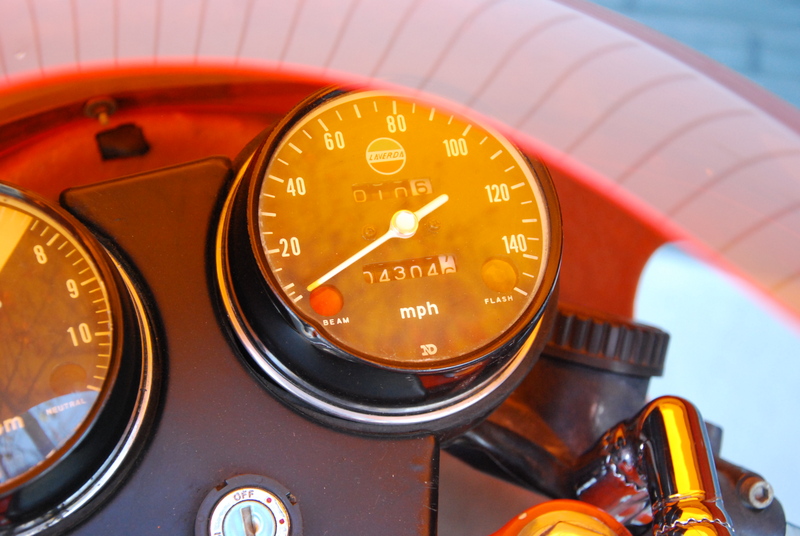 The mileage of only 4,304 is thought to be accurate. 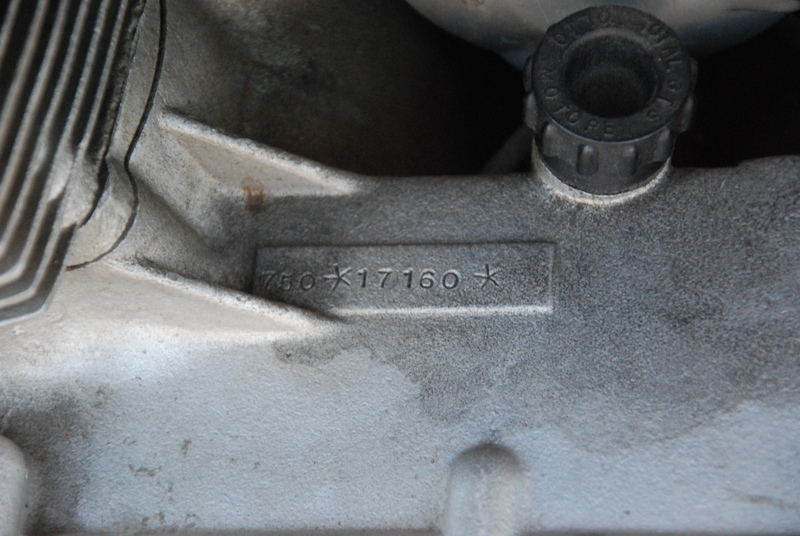 Mileage since restoration is minimal. 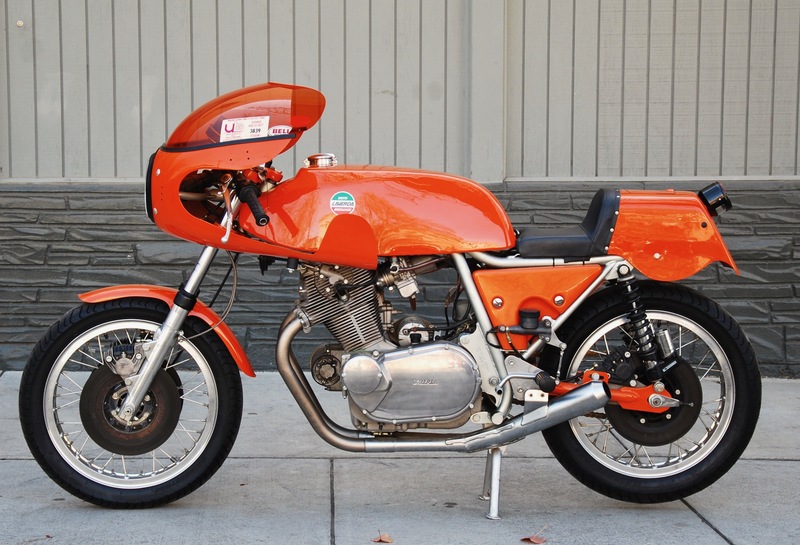 This is a magnificent example of this very rare breed; a very serious opportunity for collector or “café racer” alike.